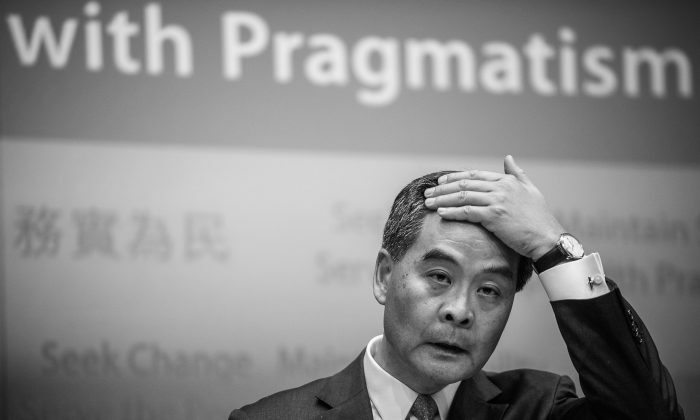 HONG KONG—Ever since Hong Kong Chief Executive Leung Chun-ying took office, the Hong Kong people have suspected that he does whatever the Chinese Communist Party (CCP) orders him to do. For example, Leung actively promoted the white paper that infuriated many people in Hong Kong by asserting the CCP’s control over the region. He has also done numerous other things to upset Hong Kongers, such as pushing for development projects that would demolish citizens’ homes. Leung is known to be a supporter of the the CCP faction loyal to former-Party head Jiang Zemin. A source familiar with the situation has reported that the Jiang faction has been using Leung to control Hong Kong since his election in 2012. The source said that the Jiang faction hopes to intensify conflicts between Hong Kong and mainland China in order to create chaos for Jiang’s rival and current CCP leader Xi Jinping. The faction also wants to use Hong Kong’s legislation to persecute the Falun Gong spiritual practice. The Xi faction is believed to have been giving Leung orders to prevent him from creating chaos. As part of this effort, Zeng Qinghong, is currently being kept under surveillance and cut off from the outside world so that Leung is unable to contact him. Leung was mentored by Zeng Qinghong, the Jiang Zemin powerbroker who has run Hong Kong for the Jiang faction. A source from the CCP’s inner circles said that the authorities are currently evaluating the situation. They have stated that they would not exclude the possibility of arresting Leung to dispel the Hong Kong people’s anger. From June 22-29, nearly 800,000 Hong Kong people voted for democracy in a civil referendum. During this sensitive political period, Xi asked Leung to take a leave for several days, according to Epoch Times source. Hong Kong political and economic columnist Liao Shiming said that under normal circumstances, if Hong Kong were in such a critical moment, the Chief Executive would have to cancel any plans to go on leave. Liao said Leung’s leave shows that Beijing authorities lack confidence in him and are trying to placate Chinese officials, senior civil servants, and business tycoons in Hong Kong by taking him off the scene. Liao added that CCP officials fear the situation will get out of control, so Xi has been unable to immediately publicly replace Leung and can only do things such as send him on leave and gradually take down Jiang’s supporters in Hong Kong. The Jiang faction, on the other hand, tried to further aggravate social conflicts by creating the white paper in June and having Leung declare his agreement with the white paper, according to Liao. If Leung is trying to help the Jiang faction create anger and dissatisfaction, he has certainly succeeded. When he first took office, he tried to carry out a national education program with “patriotic” pro-CCP classes, which Hong Kongers viewed as brainwashing. The program was cancelled after overwhelming protests. He has also utilized local triads to form pro-CCP groups such as the Hong Kong Youth Care Association, which was created to harass Falun Gong practitioners, and Voice to Hong Kong, which harasses pan-democratic parties. In addition, Leung has suppressed Hong Kong’s freedom of press by sacking the famous radio host Li Wei-ling and refusing to grant a license to Hong Kong Television Network. The June referendum wasn’t the first time Leung was asked to make himself absent from an important event. In April, Leung went with 57 Hong Kong Legislative Council (LegCo) members and their president, Jasper Tsang Yok-sing, to Shanghai for a two-day visit with CCP officials. However, after the main meeting with the officials was over, Xi’s authorities asked Leung and other CCP supporters from Hong Kong to go away. According to Tsang, only the pan-democrats were allowed to stay and meet with the officials for two more hours. During the referendum, the newspaper Global Times, which is known to be loyal to the Jiang faction, spent three days continuously publishing editorials on the referendum and on “Occupy Central with Love and Peace,” a protest Hong Kong people have planned for July calling for universal suffrage. The Global Times called the referendum “ridiculous” and an “illegal farce.” It also said that the 1.3 billion people in China should also have a say on the issue of elections in Hong Kong. Although Leung has expressed disapproval of the referendum, he also gave a speech stating that he does not agree with the Global Times reports. He said he believes those comments are putting the 1.3 billion Chinese people and the Hong Kong people on opposite sides. In response to a comment from the Hong Kong and Macau Affairs Office that the referendum was illegal, Leung said that the referendum was not developed on a legal basis, but that does not mean there have been crimes committed. He added that the referendum voters’ aspirations and demands for universal suffrage by 2017 are consistent with the views of the central government, the Hong Kong government, and himself. Leung’s stance on the referendum obviously reflects his receiving a different kind of direction from Beijing and highlights the conflict among the CCP leaders in regards to the situation in Hong Kong. Shi Cangshan, an independent analyst of Party affairs based in Washington, D.C., noted that Leung criticized a media outlet loyal to Jiang despite being a Jiang supporter. Shi said this indicates that Leung is being controlled by the authorities. Shi said that Leung is in a situation where he must say whatever they order him to say. Unable to contact Zeng, Leung has been driven to despair, Shi added. Translated by Veronica Wong. Written in English by Sally Appert.